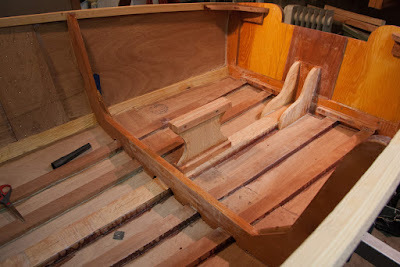 Michael's Boatbuilding Blog: The seat support turned out great. The seat support turned out great. I was very pleased with how the center support for the seat went together. 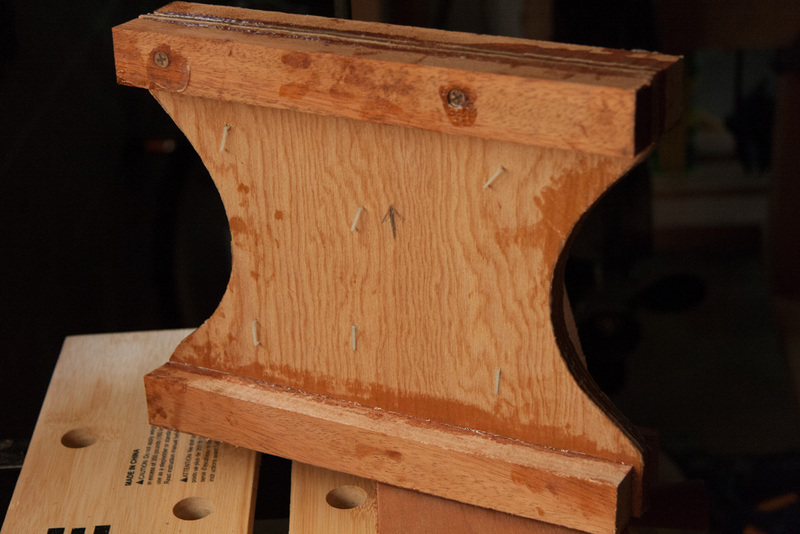 I wanted it to be 1/2" plywood, which I did not have on-hand. So, I cut two pieces from 1/4" marine-grade Douglas Fir plywood, with the intention of laminating them together. 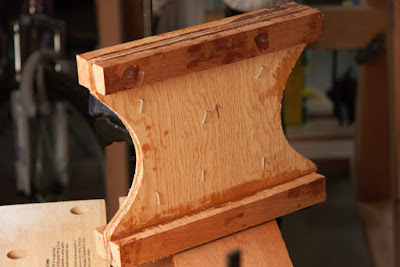 Plywood parts, cut from the poster board template. Once I had all the parts cut, (two 1/4" plywood supports, and 4 pieces of 1" x 1" mahogany blocking), I glued them all together with thickened epoxy. The Raptor stapler I bought last year once again proved perfect for holding the plywood parts together while the epoxy cured. The plastic Raptor staples were perfect for holding the plywood pieces together. 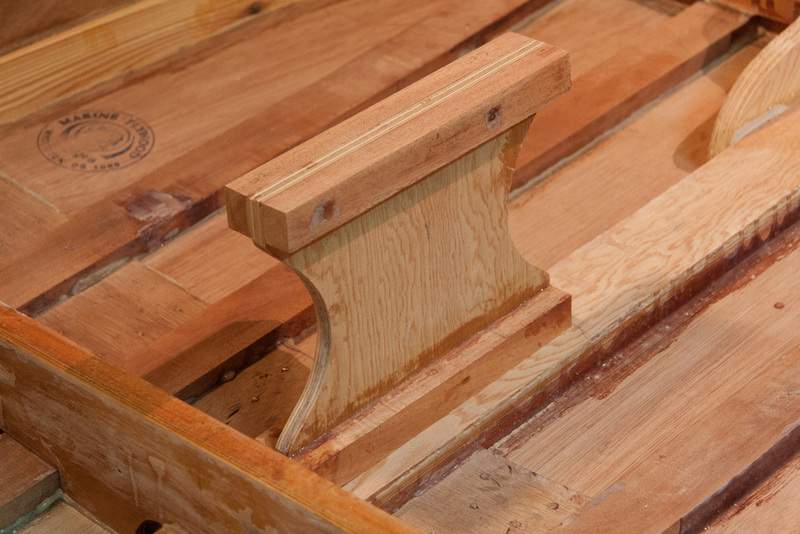 Seat support, prior to being sanded & planed. After the epoxy cured overnight, I sanded the edges smooth, and snipped and sanded the Raptor staples. These staples sand away very easily, and virtually disappear. No need to pull them, and fill the holes... just leave them there. Then I ran the top & bottom surfaces over a planer/jointer, and it was ready for the next step. 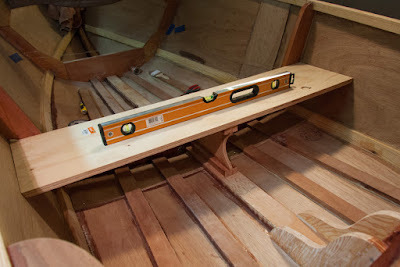 The sanded & planed seat support, sitting in its position on the keel. 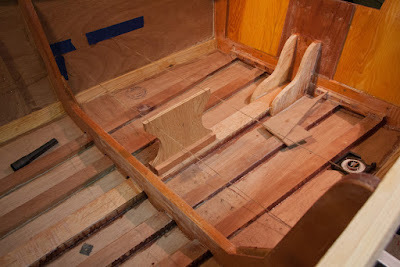 The sanded & planed seat support, sitting in position n the keel. From that point, it was time to cut the seat. According to measurements, the front edge of the seat needed to be 49" wide, and the back edge 47.5". 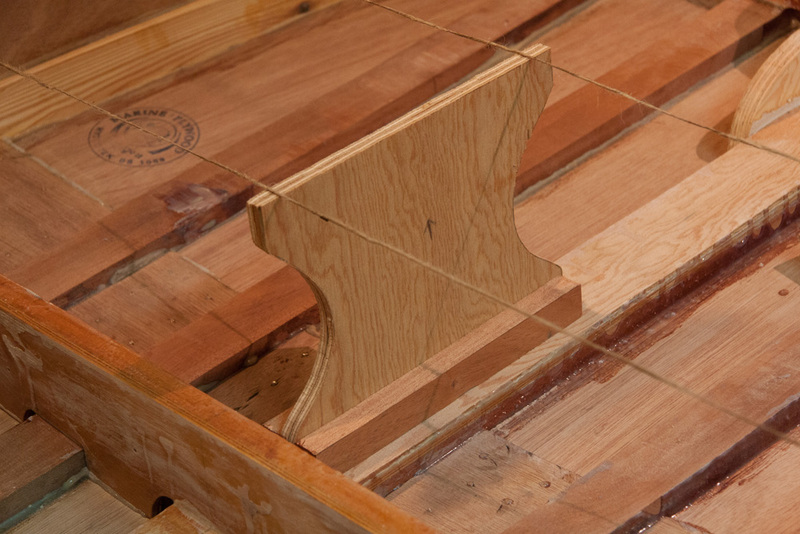 The side edges needed to be cut at a 15° bevel to match the sides of the hull. So, I drew and cut it from a piece of A-C exterior grade plywood I had on-hand. With a little minor fitting, it set into place just as well as I'd hoped. Seat cut from A-C exterior grade plywood. Without intending to, I cut the A-C plywood "ugly side up" (the C side). However, that won't really matter. My plan is to laminate a piece of the BS1088 Meranti plywood on top, so that the seats will match the transom and deck. The next step, however, is still to fit the blocking on each side of the hull to support the seat at the ends. Looking great Mike!! 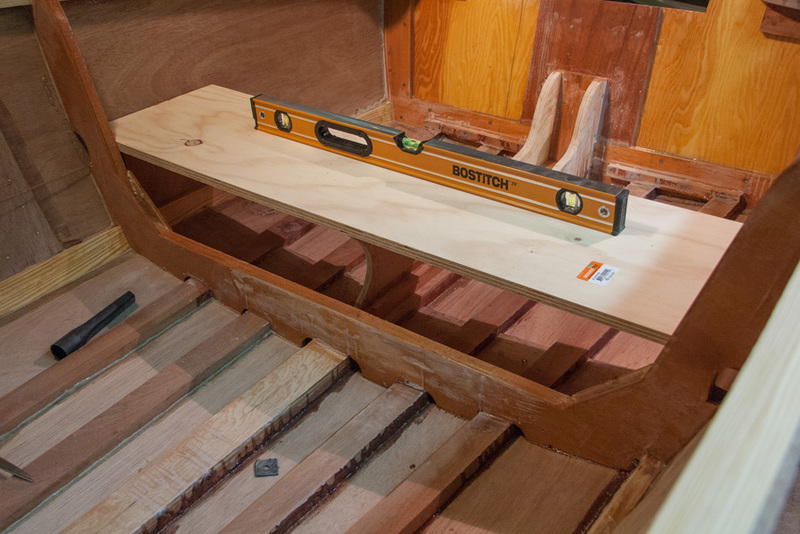 Watching your boat progress from frames to hull to flip to fitting out is driving me to get mine flipped . Can't wait to get to that point. Thanks for the regular updates. Waxed paper works better than painter's tape.